Published: Nov. 25, 2012 at 08:22 p.m. Updated: Nov. 26, 2012 at 01:53 a.m.
Where would the Baltimore Ravens be without Ray Rice? The star running back made one of the NFL season's signature plays Sunday against the San Diego Chargers, with a 30-yard catch-and-run on fourth-and-29 to help set up the game-tying field goal at the end of regulation. 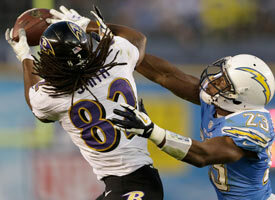 Check out the best photos from the Week 12 matchup between the Ravens and Chargers. The Ravens made sure Rice's amazing effort didn't go for nothing. On their second overtime possession, Joe Flacco marched the Ravens deep into Chargers territory before Justin Tucker kicked a 37-yard field goal to secure the unlikely 16-13 win. Coupled with yet another loss by the Ben Roethlisberger-less Pittsburgh Steelers, the Ravens now are in complete control of the AFC North at 9-2. Both these teams will remember Rice's play for a long time. It started with the Ravens in desperation mode, down 13-10 and facing fourth-and-29 on their own 37 with two minutes to play. Flacco dumped a short pass to Rice, who made three Chargers defenders miss, then received a crushing Anquan Boldin block that concussed Chargers safety Eric Weddle and secured the first down. "Hey Diddle Diddle, Rice up the middle," the running back named the play after the game, according to Jeff Zrebiec of The Baltimore Sun. After a review, the ball was re-spotted, leading to an extended delay as the chain gang tried to re-establish their spot before the Rice completion. When order was restored, Rice still had enough for a first down. The Ravens got another first down before kicking the field goal that sent the game into overtime. Considering the Chargers' almost-impressive ability to blow games, the result of overtime felt preordained. The Ravens find ways to win games they're supposed to lose. The Chargers find ways to lose games they're supposed to win. That's why one team will be playing football in January and the other will be at home, searching for a new coach and possibly a whole lot more.